Good core workouts. This ab roller ensures the strengthening of abdominal muscles, chest, shoulder, back and arms. It provides the workout advertised. When using this ab wheel, you will feel the already mentioned muscles being hard at work. 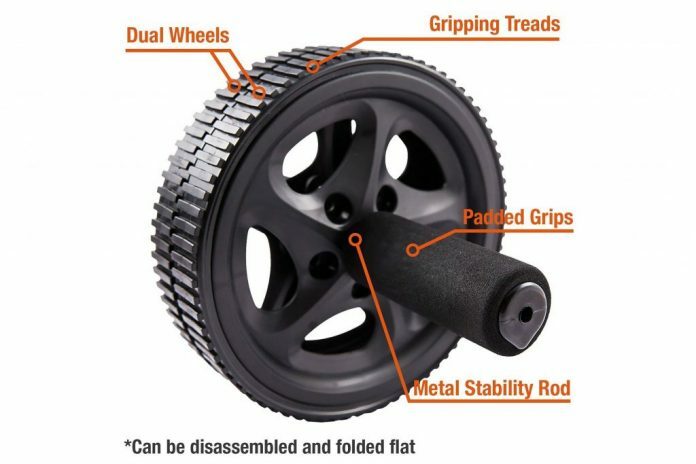 Most ab wheels fulfill this job, however, with the difference coming from other factors such as comfort, durability and stability, among others. It provides a good balance. The dual wheel design and the width resulted is enough to offer the desired confidence in your pose when exercising. Bad build quality. This ab wheel has various deal breakers, ranging from comfort to functional issues. Wheels are only suited for carpets or mats. Price is too high for the quality offered. The first thing worth mentioning is that the review takes the standard price into consideration. Right now, the ab wheel can be found at half the price on an Amazon sale, going for roughly $15. That is not always the case, however, and once it goes back to the original price, it is hard to justify it in any way. The product is suited for the entry level regarding quality. Having full plastic construction is not a problem by itself if it’s done to reduce costs, yet here the result disappointed us. We found the wheels to have a very poor performance on anything that wasn’t a mat or rug. Wood or tiles resulted in lack of grip and frequent slips, making us stop before damaging the surfaces. The plastic wheels did not look solid, giving the impression that they would wear off quite quickly. The handles were also very uncomfortable and made our workouts difficult. They even began sliding during workouts, adding to the poor impression we were left with. The manufacturer advertises lifetime warranty, yet we have a hard time trusting their ability to come with something decent at this point. The ab roller comes with no extra items in the package – no workout plans, no knee pads, resistance bands or travel bags. It is hard to explain the price in these conditions, seeing how the materials used and the build quality are below some of the models costing half of what this goes for. One good thing that we can say about this product is that it does allow for an effective workout when you don’t have problems with it. The width between the two wheels provides a good balance. However, you do need to exercise on a carpet and maybe replace the foam layers with some cloth. All in all, we do not feel like this product is a good deal considering the alternatives on the market.